Vlogging, recording videos, doing Facebook Live sessions and creating online programs. If you are running your own business, showing your face and your voice to your audience is where it’s at right now and this trend seems set to stay. It’s this fear around being ‘judged’. I’m sure we all (at least, those of us who aren’t a Trump-like ego-maniac) experience this to a greater or lesser extent. But, some people are able to ignore those “They’ll laugh at you!” voices, feel the fear and hit record anyway. 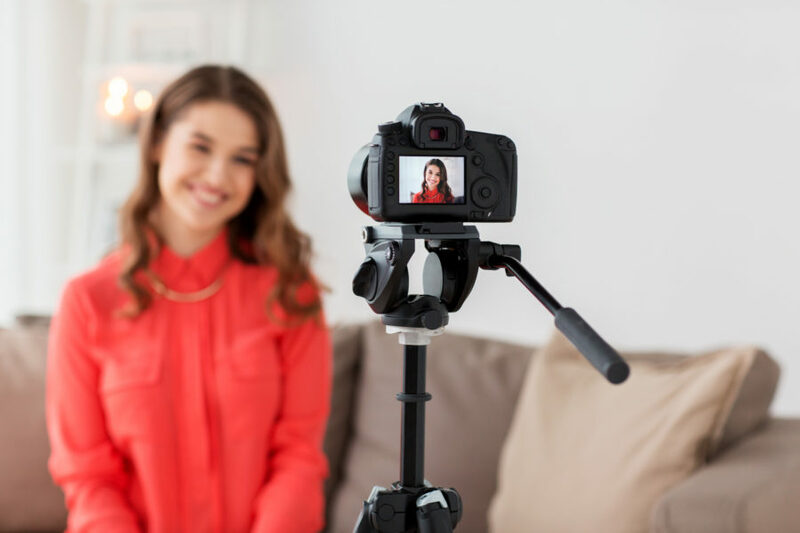 If you know in your heart of hearts that getting yourself on camera is the next big, scary thing you need to do to grow your business, or, if you’ve already made a start but you want to work on your personal image to get even greater connection and authenticity, then read on. I’ve got a lot to share on this subject, so much so, in fact, that I am soon running a free training on this very subject. You can sign up for that here. Now, I can’t help you with the fear-of-being-judged-voices. But, if wrapped up in those voices, is a ‘what the hell shall I wear?’ drama, I have some great advice, on how to present yourself to feel confident and create the best impression. The MOST important thing is this. Wear clothes that suit you. Don’t worry about fashion, what other people are wearing or what you think you should be wearing. Instead, get to grips with the colours, styles and shapes that flatter your figure and make you feel good. I appreciate this is a BIG topic, I have plenty of advice in my blog archive here, but if you want a quick, straight to the point, overview grab this freebie. • To show that you are up-to-date in your skills and knowledge, wear up-to-date clothes (not necessarily high fashion) and avoid old, faded or dated styles. Like it or not, we make a sub-conscious connection between the way someone looks and their ability to do a job. Dated clothes might be associated with outdated ideas. • To come across as credible, your outfit needs to ‘make sense’ to your viewers. It needs to sit well with the work you do and your brand (i.e. creative industry = creative outfit, high-end brand = glossy and polished look). • Avoid distractions. You are probably on film to educate, entertain and/or inspire: People will listen harder if they aren’t distracted by flicky hair, jangly jewellery or fussing with your clothes. • Marry your brand values and your message with the clothes you wear. And keep it real. • Dressing ‘smartly’ because you feel you ought to. If classic looks don’t suit you or make you feel too severe, please don’t wear a suit. A dress or separates will help you to come across as more authentic. If your business vibe is relaxed and open, a suit is probably a no-no. • Being over-powered by print and colour. Some people need bold colours to come alive, others are overwhelmed by them. Get to know your best colours. Red and orange often don’t translate well on camera and busy prints are best avoided unless you know they work well for you. • Showing off too much skin. Check how much cleavage your outfit shows and check you are ok with it. Some necklines mean you inadvertently reveal more than you intended. Do a screen test. Also, certain lighting can make your arms look lumpier and bumpier than you’d like. Try a half or full sleeve, or cover up with a jacket if you feel self-conscious. • Glasses reflecting back onto the screen. This can look very strange but more importantly means we can’t see your eyes properly. It is vital that your viewers can see into your eyes to make that all important connection with your message. Either remove your glasses (if you can manage without!) or choose a pair with non-reflective lenses. And finally, you don’t need a new outfit for every piece of content. Mix and match your separates to create different looks. You can add and take away jackets, cardigans, jewellery and scarves to create totally different looks without having to buy a ton of new outfits. • How to always feel confident on camera. • The key mistakes people make when deciding what to wear on video and how to avoid them. • The one thing that will ensure you look like YOU on screen and not an imposter. • How to eliminate the ‘what-the-hell-to-wear-on-camera’ stress. Forever. Get Camera Ready is happening on Friday 2nd February at 12 noon. Register here to tune in live or to access the recording.